Want to upgrade dual boot hard drive without reinstalling system, you can simply clone dual boot hard drive to the new one (SSD) . Do You Still Worry About These Problems? A dual boot hard drive means you installed two operating systems on the same hard disk. When booting, you can choose either of them to use. During the use, there are some situations you want to clone dual boot hard disk to a new one. 1.The drive is too small and its capacity cannot satisfy my needs at all under certain circumstances. Usually, the desktop computers are allowed to install more than one hard drive to satisfy the needs of a greater storage space. But the laptop computers only can permit one internal hard drive inside. Thus, the capacity becomes a common question which almost of us will encounter. To this problem, cloning the dual boot drive to a larger hard disk drive (HDD) or solid state drive (SSD) can be a great solution. 2.The hard disk drive is not good enough. The data in the hard disk drive is stored in the random access memory (RAM), so it is not essential to trouble yourself for data loss. However, there is an another question the speed is lower. Compared with hard disk drive, solid state drive has a non-volatile memory power, typically fast access time and lower latency. Thus, To clone dual boot drive to SSD will be a priority selection for you. 3.The hard drive goes wrong in a way. When your computer use for a period of time, some unreasonable failures could happen, such as hardware failure, virus, hacker attack, files system failure etc. All these problems are something you can not preview, thus backing up your data in a regular way is a great way. If you have already backed up your data ahead of something wrong, you can clone dual boot to a new hard drive or restore it. 4. To reinstall the operating system makes people feel extremely uncomfortable. During the installation,you have nothing to do but wait for a few hours even more, and then install applications and setting files you will use in your daily life. 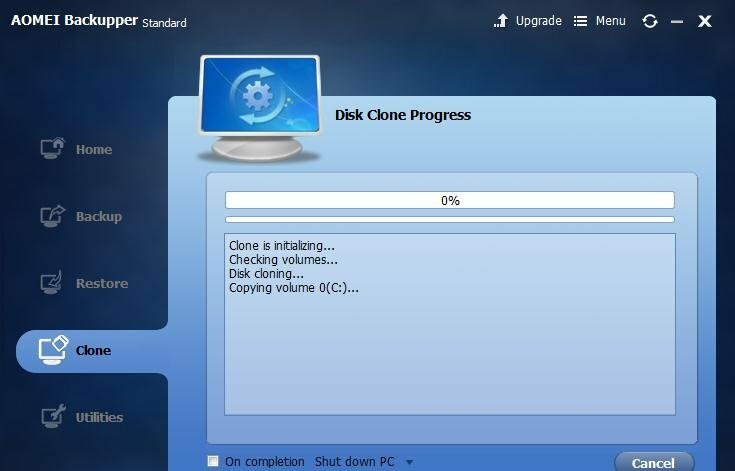 In order to avoid reinstalling your operating system, you could clone it to another drive. AOMEI Backupper may be a great choice. Will non-Windows System Be Cloned? 1. Is it all operating system working in AOMEI Backupper freeware? Up to now, it can support all the files systems recognized by Windows, such as Ubuntu file system, Ext3, Ext4 etc. Don’t worry about it. In this cases, you could make use of System Clone to clone Windows system, and use Partition Clone to clone relevant file system. More detail information about it, click: System Clone. 2. What if one of the operating systems can not boot after clone? The operating system can not boot mainly because you just clone either operating system or boot files. 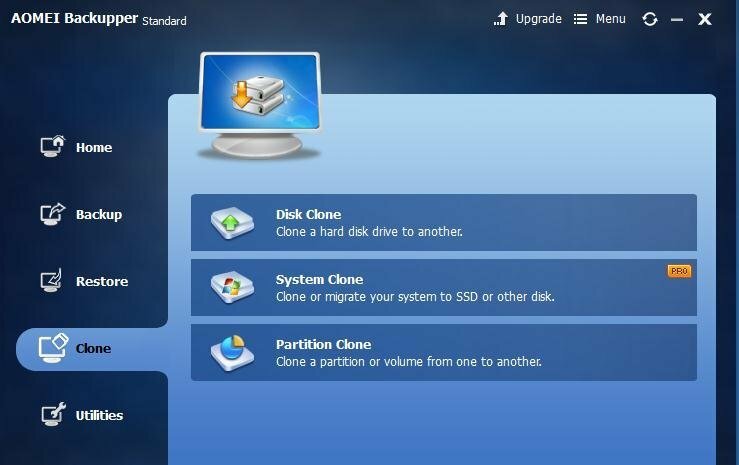 You need clone both operating system and boot files using Sector by Sector Clone, which will clone the entire hard drive including the space not used. Before starting the operation, you have to connect your SSD hard drive to your computer and make sure it can be recognized by Windows. 1. Download AOMEI Backupper Standard and then boot into Windows XP system, select the Disk Clone option under the Clone tab. 2. Select the Source Disk that you want to clone and click Next. 3. Select your SSD hard drive as Destination Disk, then click Next. 4. Preview the information of Source Disk and Destination Disk, then set the advanced setting you want on this page. Tip: Please remember to tick the check box before Align partition to optimize for SSD, since this operating can accelerate the read and write speed of a solid state disk. 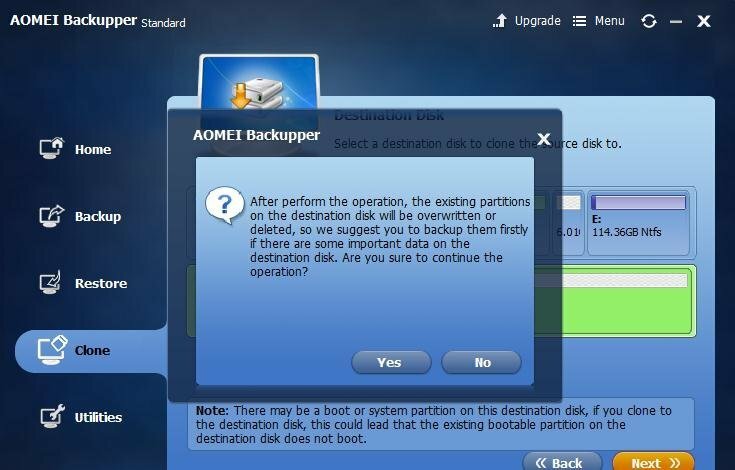 After you select this choice, AOMEI Backupper can automatically execute it during the disk clone process. 5. Start the operation. In this Wizard page, you can see that the existing data on the Destination Disk will be overwritten, thus you must make sure if there is any important data. If there is, you would better back up it in advance. 1. After Disk Clone finish, the Destination Disk will be overwritten. If any important data exists inside, especially your personal files, you must back up it in advance. 2. The capacity of Destination Disk requires more than Source Disk. So, you must make sure that the capacity is big enough to convert completely. 3. When you start to clone dual boot to a new hard drive(SSD)and there are some programs occupy it, AOMEI Backupper will prompt you to restart your computer, and then finish this task in a “restart mode”.